Inquiry is a processes of knowledge seeking for knowledge building. Inquiry is characterized by curiosity, observation, questioning, hypothesizing, investigation, evaluation, discovery, evidence seeking, making connections, collaboration, argument building, synthesis, meaning making, problem solving, expression and reflection. Inquiry is messy, and often involves periods of uncertainty and confusion. Inquiry requires persistence, flexibility, independence, risk taking and open mindedness. Inquiry often results with more questions than actual answers. These terms are often used interchangeably. Research tends to have a more formal connotation and is often characterized by the investigation, writing, documentation and publishing parts of the process. Inquiry is characterized by questioning, based on the understanding that questioning leads to deeper connections, meaning making and/or innovation. Inquiry is often used to identify a more hands on kind of learning experience, while the term research is often used to identify qualitative outcomes, such as “the research proves.” Maybe because research is a more commonly used terminology and definitely because inquiry is essential for original research, librarians often use the term “inquiry based research”. It’s important to note that fact finding alone is neither inquiry nor research. Information literacy/fluency skills, disposition and responsibilities are integral to Inquiry. In general, Information literacy is the ability to utilize the skills, tools and dispositions necessary to effectively identify, find, evaluate, analyze, synthesize, express and share information in an ethical and effective manner. The American Association for School Librarians (AASL) Standards for 21st Century Learners outlines the information based competencies necessary for inquiry and independent learning. Purposes for Inquiry include, but are not limited to: solving a problem, forming an evidence based argument, making an informed purchasing decision, pursuing an area of interest, deepening personal understandings, and/or creating change and innovation.Expressions of Inquiry include, but are not limited to: a sales pitch, debate participation, an informed purchasing decision, an investment, a paper, a blog post, a book, a video, a plan, a speech and/or an interview. Inquiry is a student driven learning experience in which teachers act as guides. Inquiry learning experiences not only allow students to construct knowledge related to the particular area of Inquiry, but more importantly to develop the skills and dispositions necessary to construct knowledge independently for future inquires. Through the Inquiry Process, students learn how to learn. School librarians (teacher librarians, library media specialists) teach the skills and dispositions necessary for effective Inquiry. Standard 1.1.1 of AASL’s Standards for 21st Century Learners, reads: Learners use skills resources and tools to: “Follow an Inquiry-based process in seeking knowledge in curricular subjects, and make the real-world connection for using this process in own life”School librarians live and breathe Inquiry! Librarian developed Inquiry Learning Processes/models scaffold and clarify the thinking skills and dispositions necessary for Inquiry learning. Recognized Inquiry Processes are similar with a difference in terminology and emphasis. Although these models may appear step like, they are not meant to be linear. For example, the more someone learns about something the more questions they tend to have. Although Common Core State Standard developers chose to not use the term Inquiry, the skills and dispositions necessary for Inquiry are those that the Common Core emphasizes. Inquiry learning fosters the critical thinking, perseverance, evidence seeking and deep learning understandings associated with the Common Core.An analysis of the Crosswalk, between Common Core Standards and AASL’s Standards for 21st Century Learners, details and highlights how the skills and dispositions associated with Inquiry learning are vital for meeting Common Core Standards. My impetus for writing this post, which became an Inquiry in and of itself, was our school district’s purchase of a “Research Report Writing Unit”. My concerns about the unit allowed me to dig deeper in order to clarify Inquiry for a general education audience. We’ve been working towards utilizing an Inquiry model, in our school and district, in order that students have a greater opportunity for skill transfer. Although there is something to be said for sharing with students that no matter the terminology, the understandings are the same or similar, the terminology and skills chosen for this unit may work to confuse students. In addition, because this unit is, at this point, the only complete inquiry based research learning experience our students will experience while attending our school, it would be most beneficial if students have the opportunity to utilize a researched and proven Inquiry process. Because this unit was purchased, it needs to be utilized. In retrospect, during planning, I should have suggested framing the unit with Stripling’s Inquiry Model and pulling scope and sequence sections out from the purchased unit as they fit into this well established Inquiry process. This would have been beneficial not only because we’d be starting with a proven model, but also because we would have more effectively been able to identify missing skills and understandings. Small, Ruth V. and Marilyn Arnone, Barbara K Stripling, Pam Berger.Teaching for Inquiry. Neal-Schuman Publishers, Inc. 2012. Harada, Violet and Joan M. Yoshina. Inquiry Learning Through Librarian-Teacher Partnerships. Linworth Publishing, 2004. Kuhlthau, Carol Collier. “Inquiry Inspires Original Research.” School Library Monthly. N.p., n.d. Web. 19 Aug. 2014. <http://www.schoollibrarymonthly.com/articles/Kuhlthau2013-v30n2p5.html&gt;. Kuhlthau, Carol Collier. “Guided Inquiry: School Libraries in the 21st Century” School Libraries Worldwide, Jan 2010, Vol 16, No 1,17-28. Kathy Singerline and I have worked closely together in designing her 6th grade Critical Thinking cycle class. The learning goals have remained fairly static, however the way of achieving those goals has gone through a number of transformations, or in other words, a Problem Based Learning Challenge in and of itself! Our goals for her students include the following skills, dispositions and responsibilities. Questioning: SWBAT create, identify and practice questioning for learning skills. Students will develop an understanding of curiosity as a means for learning, growth and change. Students will realize their role in asking questions to promote collaborative learning and creation. Information Fluency: SWBAT find, evaluate and apply information based on needs and interests. Students will utilize a process for learning using information. Students will develop an understanding of how and why information is shared, the need for evaluating information based on author’s purpose, authority and currency and how information can be used for learning, creating and sharing. Students will realize that they have a role in sharing information ethically in a cyber connected world. Design: SWBAT apply what they learned about questioning and information fluency within the Design Process. They will participate in design based learning experiences including game design. They will develop an understanding of the need for empathy, wonder, risk taking as it relates to design. They will realize the role design plays in in creating change. This cycle, Kathy and I have been discussing how students can participate in a cycle long project that fosters most or all of these skills and understandings. We’d like to have their projects be problem based, student determined and real world, so that the learning would be authentic and at best, make a difference. All of this seems like a perfect #geniouscon opportunity! It seems fairly obvious that the questioning and Information Literacy skills and understandings can best be learned within an an actual Inquiry based project. The design piece could also be incorporated within this framework. However, I’m not sure exactly how. What I can’t quite figure out is where the Inquiry Process and the Design Thinking Process intersect. If you have any thoughts please share. In the meantime I will keep thinking and learning more about the design process! 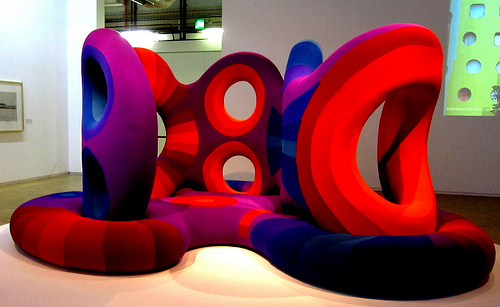 Oh Paris, Living Sculpture by Verner Panton, Flickr, 25 June 2011. Web. Last week, at the invitation of and in accompaniment with, our school’s Literacy Coach, Jessica Rastami, I participated in an awesome four day mini institute on Content Literacy and the Common Core, at Columbia’s Teacher College, Reading and Writing Project. Although I’ve yet to thoroughly synthesize all that we learned, I thought I’d take a moment here to reflect on some “aha” moments! Utilizing “I Think I Knows” to engage researchers: The Institute’s first keynote, Tony Stead, suggested replacing K-W-L charts with a method for analyzing nonfiction which he’s coined: RAN. Acronym aside, I like his idea of using “I think I knows” similarly to questioning, as a tool for focusing and fueling research. Nuggets of information are not meaningless. Our second day keynote, Donna Santman, after telling us a story about her daughter trading “Did you know?” nuggets of information with a friend, suggested the importance of these fun facts not just as an impetuous for learning more, but also for the discovery in and of themselves. Questioning and synthesis go hand in hand throughout the learning process. Although I’ve always seen questioning as something that fostered deeper learning throughout the learning process, I failed to see synthesis similarly. I tended to think of synthesis as some kind of magical something that only happened after you’d digested enough information. Now I see synthesis as a way to digest the information. Making connections is not only the end result, but a also part of the process for deeper learning. Synthesis can be strategized. Although I still believe that librarians are well equipped at fostering “learning to learn” skills, dispositions and responsibilities, I had no clue that there was a way to strategize synthesis, other than maybe mind mapping or traditional outlining as a means for organization. In fact, my education, even in note taking, other than using electronic tools and two column Cornell style notes, was unclear. I knew little about tools such as: boxes and bullets, Venn diagrams, cause and effect, timelines, question and answer as a mean to both note take and analyze and synthesize information, throughout the learning process. I was blown away by the concept of Thinking Maps, enthusiastically shared by a participant as her district’s chosen means for directing learning. They even use Thinking maps in all of their PD sessions including deconstructing the Common Core. Students are taught to draw the thinking map from memory that best fits his/her thinking need. Love this! 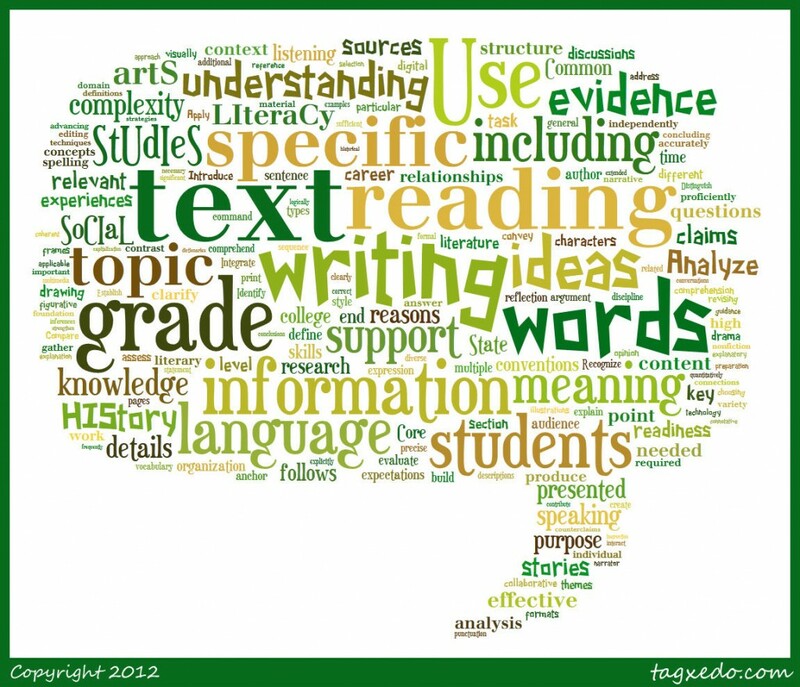 Librarians are invaluable for providing needed “text sets” across various media platforms. Our four day long study centered around the Civil Rights movement. Teachers College’s chosen means for learning includes primary source centers, read-alouds, mini lectures, all class discussions and debate. Teachers, (posing as students), deepened their learning using music, photos, letters of note, personal accounts, video, historical fiction and nonfiction picture, narrative and survey type books. Other than me, being maybe the only teacher-librarian in attendance, other participants were overwhelmed with the thought of gathering all of these resources. All were sharing my tweets sharing resource portals! 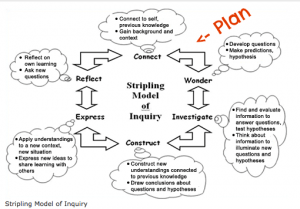 Transfer and an Inquiry model for Learning. In their research on best practices for incorporating Common Core literacy skills within content area learning, Teacher’s College Reading and Writing Project seemed to lack librarian guidance. At the basic level, a website was shared with over a hundred people, as being a good resource, and all I can say is that it is far from a credible! Also, in reaction to the question “Where did you find this picture?” the response was, “I just googled civil rights.” (In note, this lack of understanding was only evidenced in one presenter’s presentations and so is not indicative of the team). On a larger level though, there was no discussion about independent investigation or a complete model for Inquiry. I would have liked more discussion on how students might transfer the process skills learned within this framework to independent research. Note to self: we need to work on this integration! Librarians need to be part of the beginning, middle and end. Providing students and teachers with needed information, however, is not enough. Teaching them how to find and evaluate the information they need is necessary, but still not enough. Teaching students ways to express and share what they’ve learned is important, but still not enough. To stay vital now, we need to be the middle piece too: the piece that helps students digest the info, figure out its place in their bigger picture understanding, and make it their own. Note to self and any other TL’s who are reading: Teacher-librarians must attend conferences which emphasize literacies across all content areas. We must join Twitter talks such as #sschat which are predominated by content area teachers. We must join curriculum committees in all learning areas. 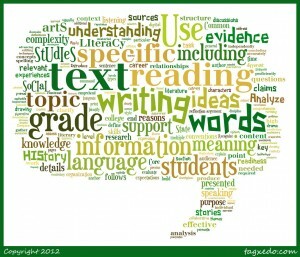 We must speak the literacy talk that’s emphasized in all things common core. We must be at the essence of student learning, because that is where we belong!